Pope Francis got the keys to a fancy new Lamborghini on Wednesday — but he won't be tooling around the Vatican gardens in it. Instead, the special edition Huracan will be auctioned off by Sotheby's, with the proceeds going to charities including one aimed at helping rebuild Christian communities in Iraq that were devastated by the Islamic State group. 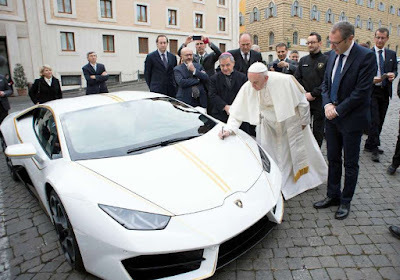 Officials from the luxury sports car maker presented Francis with the sleek white car with papal yellow-gold detailing on Wednesday, outside the Vatican hotel where he lives. The pope promptly blessed it. Base prices for the Huracan, which was first introduced in 2014, usually start at around 183,000 euros ($217,000.) A special edition built for a papal charity would be expected to fetch far more at auction. Francis got around his native Buenos Aires on public transport and has long railed against people who buy the latest model cars or cellphones. As pope, he uses a blue Ford Focus inside the Vatican walls, and he has made a statement on all his foreign trips by shunning fancy, bullet-proof SUVs and opting instead for modest Fiats or KIAs.